Treat yourself and that special someone to a romantic getaway in the perfect location in Niagara Falls!. Niagara Square Shopping Centre is located on Montrose Road, just a 10 minute drive from Niagara Falls and Clifton Hill. With 45 shops and services, Niagara Square is a good place to find a diverse selection of merchandise. The ideal "one-stop shopping" destination. This relaxing mall makes you feel at home. Shopping in Niagara Falls is a fun experience. At one time the largest mall in the area, Niagara Square still one of the city's key destinations to shop. And if your family loves chocolate, don't forget to stop at Laura Secord. 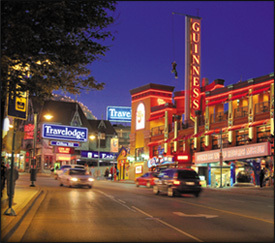 Clifton Hill Niagara Falls boasts many top-rated family attractions. So much to do. When you visit Clifton Hill Niagara Falls, family dining is affordable and varied. Clifton Hill Niagara Falls is a unique shopping district with a great variety of goods. Ride to Fun! This state-of-the-art bus system connects Clifton Hill with all tourist areas. So much to do and so much to see. Click here for a guide to Niagara Falls entertainment. From Fire Works every weekend in the summer to the Festival of Lights in winter.